Tween Tuesday is a weekly meme created by GreenBeanTeenQueen, one of my favorite blogs. Surprise, surprise - it features books aimed at Tweens. "Sibley Carter is a moron and a worldclass jerk." When Julian Carter-Li intercepts an angry e-mail message meant for his greedy, high-powere...more "Sibley Carter is a moron and a worldclass jerk." When Julian Carter-Li intercepts an angry e-mail message meant for his greedy, high-powered uncle, it sets him on the course to stop an environmental crime! 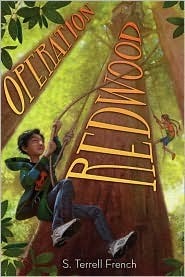 His uncle’s company plans to cut down some of the oldest remaining California redwood trees, and it’s up to Julian and a ragtag group of friends to figure out a way to stop them. This fantastic debut novel, full of clever stunts and pranks, shows the power of determined individuals, no matter what their age, to stand up to wrongdoing. And it introduces readers to a memorable cast of characters—smart kids who care about the world around them. Life is pretty bad for Julian Carter-Li as Operation Redwood begins. His mother has essentially abandoned him to "find herself" in China, leaving him with his rich aunt and uncle who hate him. Julian is a quiet boy, not the type to rebel or rock the boat. You can tell he's unhappy, but he just goes on with his life as best he can. This all changes on the day he's left sick in his uncle's office. He spies two e-mails on his uncle's computer, one elaborating on the family's dislike of Julian, and the other from an irate girl protesting his uncle's plan to cut down the ancient redwood trees adjacent to her family's property. Curious, Julian and his best friend Danny strike up a correspondence with the girl. Robin is 12 years old like Julian and Danny but lives an entirely different life on a ranch in rural northern California. Julian is inspired by Danny and Robin's bold natures and big ideas. The obedient kid suddenly escapes math camp to live as an exchange student on Robin's farm. He is just as entranced with the gigantic redwoods as Robin and has adventure after adventure as he, Robin, and Danny try to save the trees. Operation Redwood is an engaging tale that manages both to entertain and educate. I learned a lot about redwood trees but in a way that never felt didactic. For a plot-driven tale, the characters are very well-developed. Julian, Danny, and Robin have distinct personalities and are written with very different voices. I loved Danny - who views the world with bigger than life lenses and dreams up one scheme after another - even though I'd probably find him annoying in real life. Robin is also a gutsy, passionate girl. She thinks she can do anything. I liked Julian's relationship with his cousin Preston. Too often, books create Dursley-like families - with evil adult figures and their evil children. Here, Julian's aunt and uncle are snobbish and cruel, but Julian gets along well with his cute 8-year-old cousin. This is a great book for early tween readers. It appeals equally to boys and girls. I thought the pacing of the book dragged a little, but it never kept me from reading; just don't expect a suspense-filled thriller. My only other complaint with the book is that it occasionally felt a little "young." But I blame that largely on being an adult more accustomed to YA lit than younger tween books. It was full of substance, had a relatively realistic plot, and three-dimensional characters. Whether or not you're interested in environmentalism, I recommend Operation Redwood. I haven't heard about this one, but it sounds like a good read!